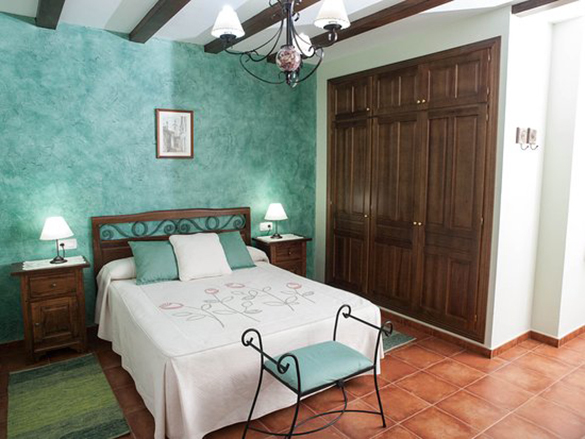 Spain is crossed by old cattle drove routes that served the pastoral economies of yesteryear. 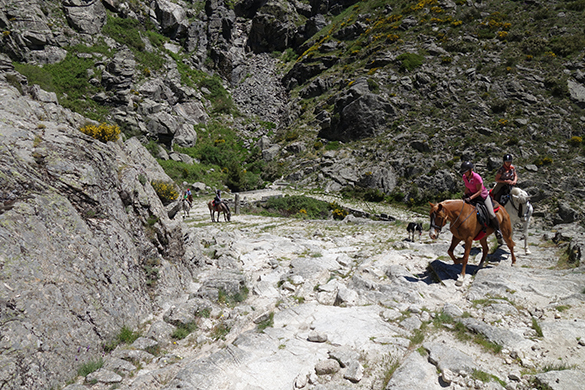 In Spain, these trails are called “Cañadas Reales” with 75m wide and around 800km long. They are still used by cattlemen who practice transhumance, spending summer in the mountains with their cattle and returning each autumn to the winter pastures, lowlands, faraway. 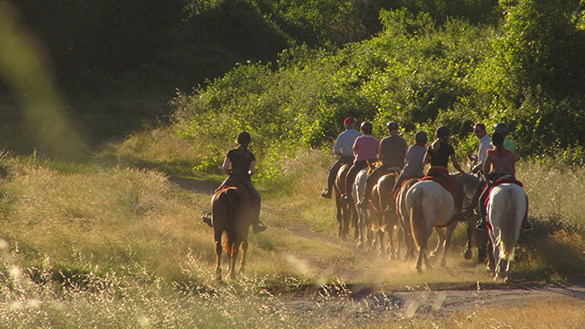 These old trails are more than merely routes for sending livestock to market. These routes are the toll motorways of yesteryear, the infrastructure that sustained transhumance. 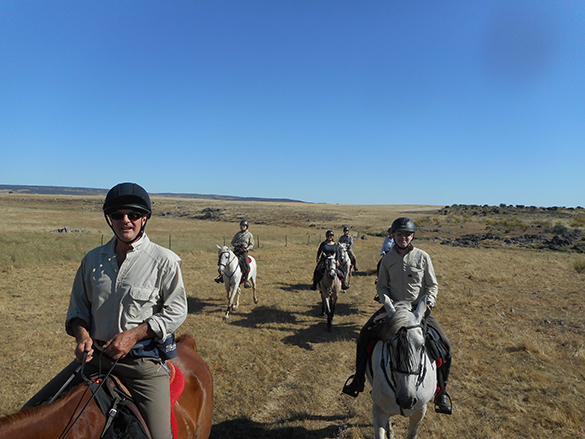 This is a real experience travelling on horseback, we follow the “Cañada Real” 75 m wide with a thousand years old, pure nature, during 200 km from Trujillo to Navarredonda de Gredos or vice versa, crossing 3 different region in Spain (Extremadura, Castilla la Mancha y Castilla y León), riding in Cáceres province, Toledo province and Ávila province. Exclusive for genuine riders! 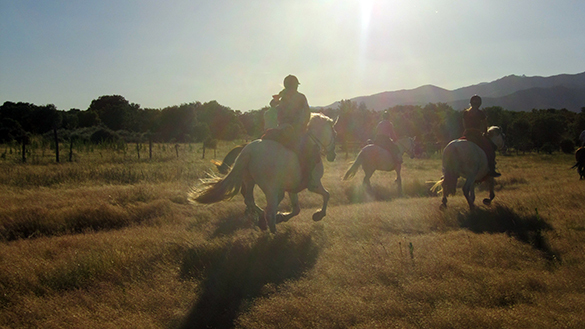 Emilio knows very well the Cañadas reales, keeping his family tradition that for ages, practiced the transhumance with the cattle, so he will show you interesting facts along the way. 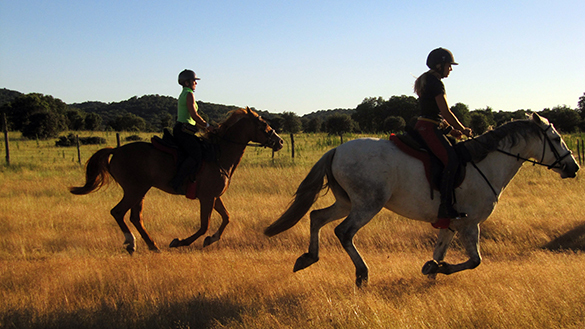 The pace of this ride is moderated, walk, trots and long canters along the Cañadas Reales. The distance covered on the average is 25-35 km per day. 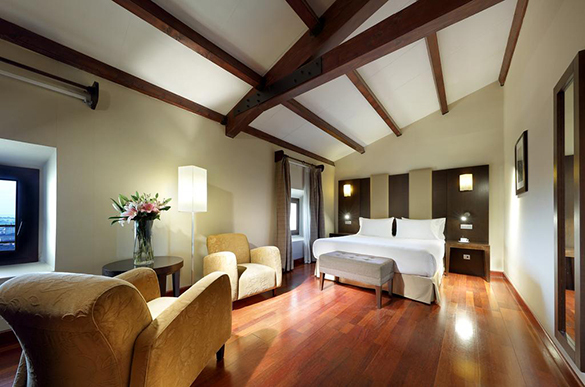 Meet at Madrid airport (meeting time is at 3pm), transfer to Trujillo, 2,5 hours’ drive. 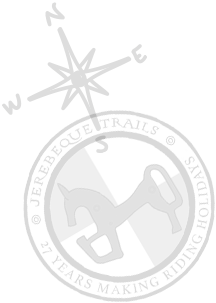 Time to visit to the spectacular town of Trujillo before welcome dinner at the hotel with us where we learn about the Transhumance on the map. 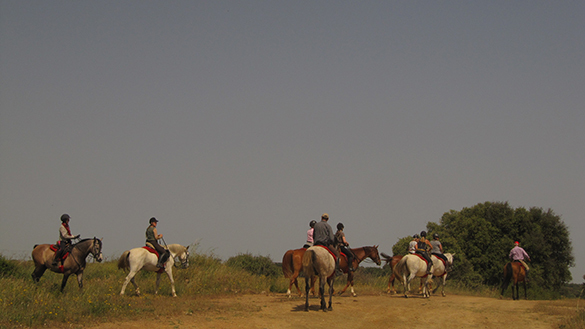 Transfer from Trujillo town to Herguijuela (10 min) where the horses are, distribution of horses. 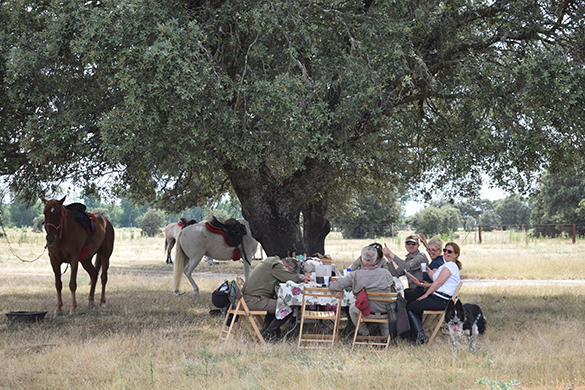 Riding through the “Cañada Real”, Lunch in the countryside with excellent paella cooked by us at the spot. 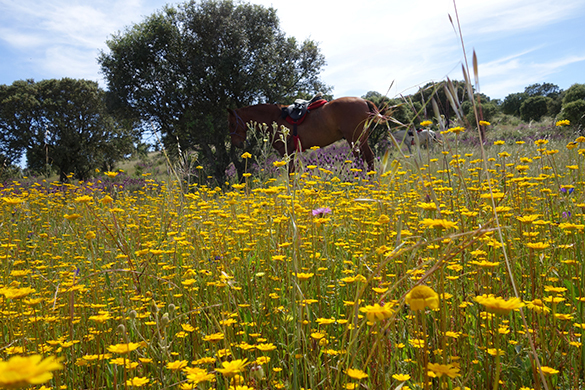 In the afternoon across flat terrain to Torrecillas de la Tiesa. 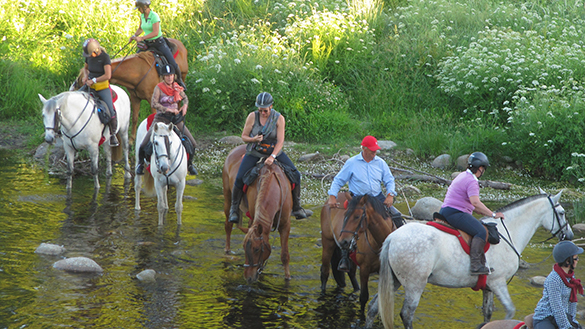 Night and dinner in very nice rural Inn, time on the saddle 5 hours. 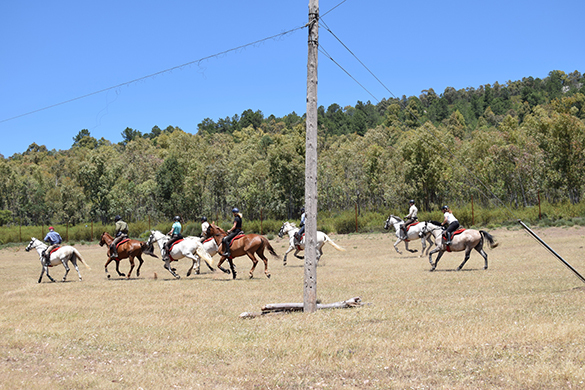 Departure after breakfast, we ride in the morning in opened countryside trough Dehesas and beautiful landscape. 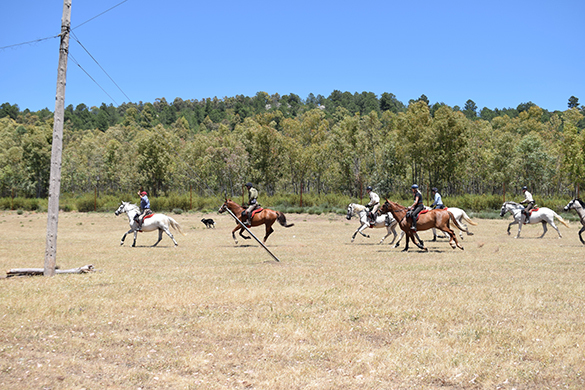 Good trots and canters in the morning. Lunch in the countryside. 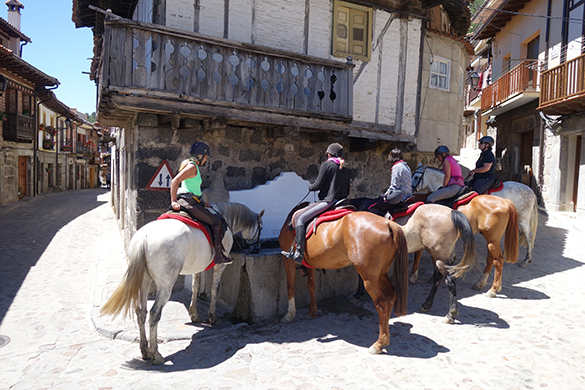 In the afternoon a short ride to Casas de Miravete, a small village in a spectacular enclave in the Monfrague National Park. Dinner at local bar with good local food and overnight at rural Inn. Time on the saddle 6 hours. 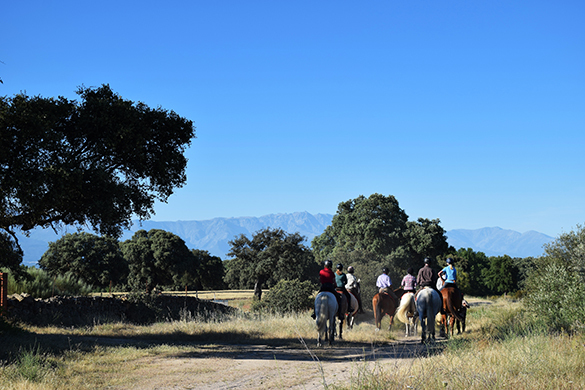 Day 4 CASAS DE MIRAVETE- NAVALMORAL Riding in the morning along the “Cañada Real”, with impressive views of Sierra the Gredos in front of us. 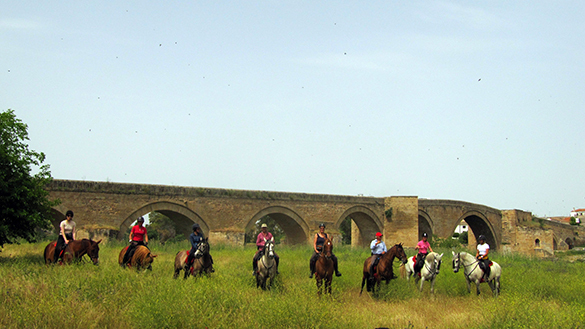 Crossing the Albalat Bridge (16th century) over the Tagus River, one of the important public works built during the reign of His Catholic Majesty Charles I of Spain and V of Germany with a great shield in relief of Emperor Charles with the double eagle. Pic-nic by the Tagus river reservoir water. 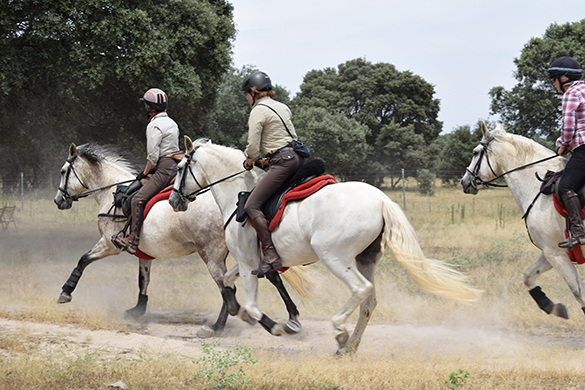 Riding in the afternoon to Navalmoral de la Mata. Dinner and night at small hotel. Time on the saddle 7 hours. 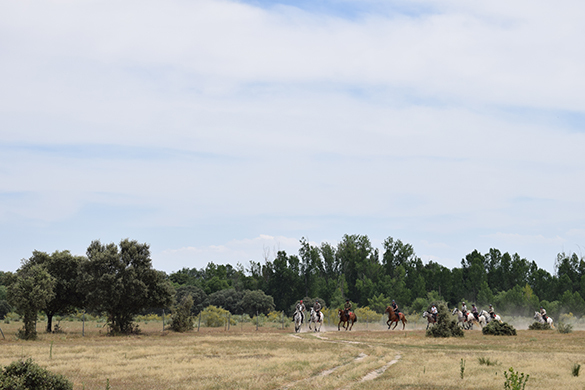 Departure after breakfast, we follow the Cañada Real in a flatter area with good trots and canters. 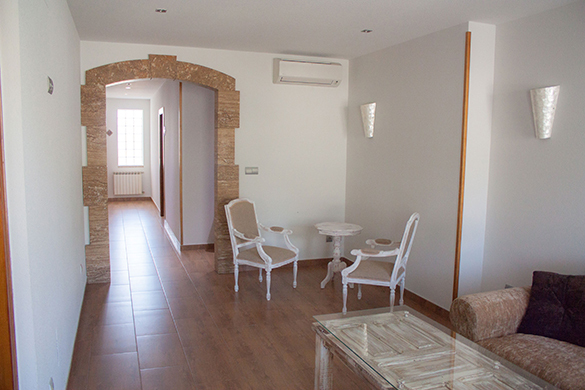 Here the Cañada has an unusual wide of 200m. 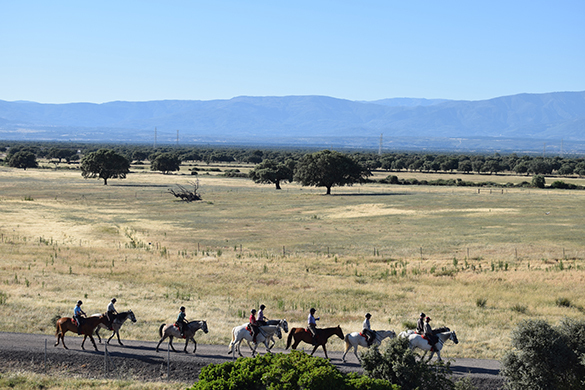 Horses spend the night at Las Ventas de San Julian, transfer for dinner and night at beautiful Rural Inn in Calzada de Oropesa. Time on the saddle 6 hours. 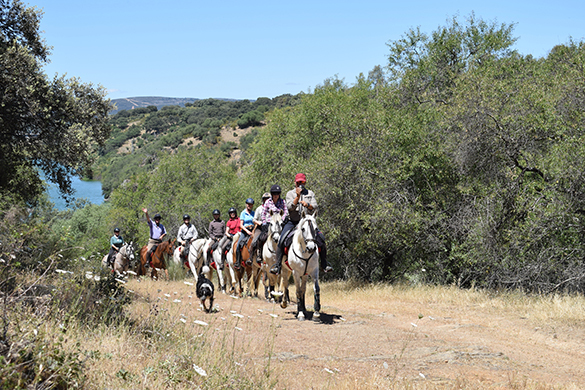 Departure after breakfast, we continue following the Cañada Real, here the landscape changes, we ride along the reservoir water close to Navalcan with beautiful views of the Gredos Mountains. 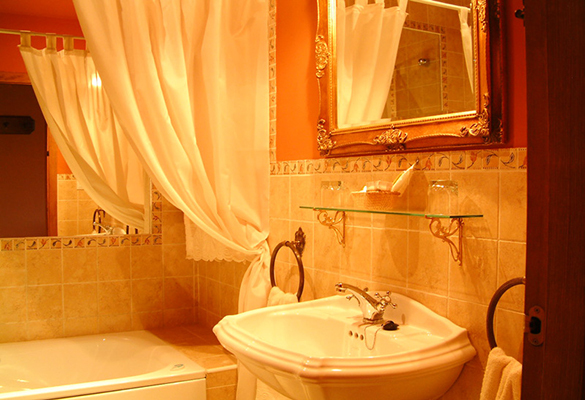 Dinner and night at lovely rural Inn in Navalcán. Time on the saddle 6 hours. 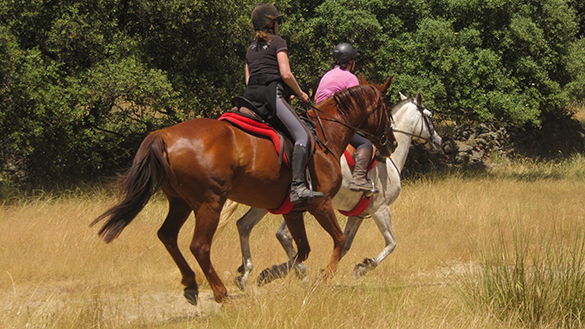 This day is a beautiful day from Navalcán to Mombeltrán, this day we change the Cañada to take another Cañada to go to the Gredos Mountains. Beautiful views, Toledo province is left and we cross to Avila province in Castilla y Leon. 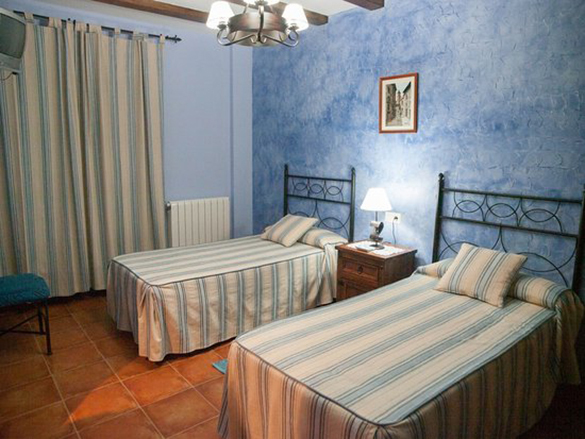 Dinner and night at hotel in Mombeltrán. 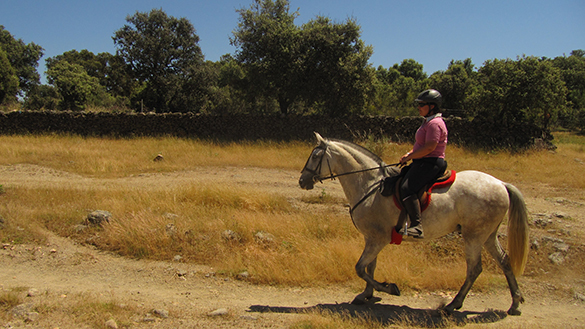 After breakfast we start to climb the Roman Road with more than two thousand years old, very well preserved. 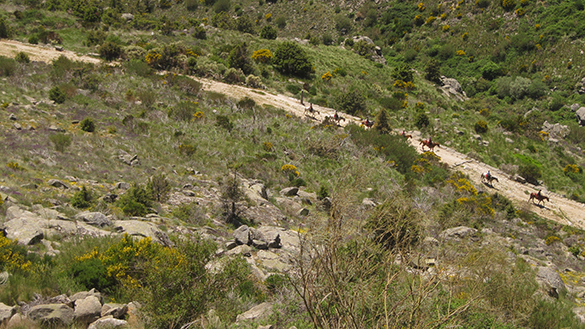 It was used for the Roman armies and the transport of metals crossing the Sierra de Gredos through the abrupt mountain pass Puerto del Pico. Later on, it worked as a cattle drove in the medieval time, despite the passage of centuries, is still in good condition. 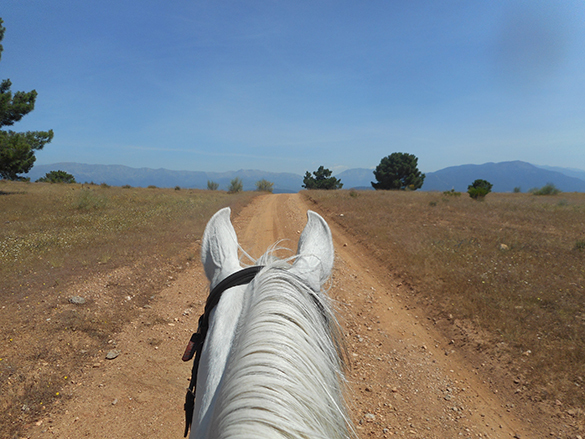 We ride on the Roman road up the mountains with amazing views, crossing the picturesque mountain village. Cuevas del Valle. When we get the Puerto del Pico, at the end of the Roman road, the landscape change very much, beautiful mountainous landscape. 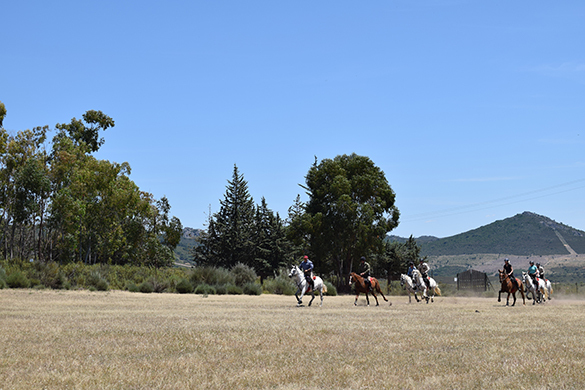 Lunch at local restaurant at Puerto del Pico, after lunch riding in very different landscape, green mountain pastures with stone walls and the highest peaks of Gredos in front of us to finish the amazing horse riding trip. 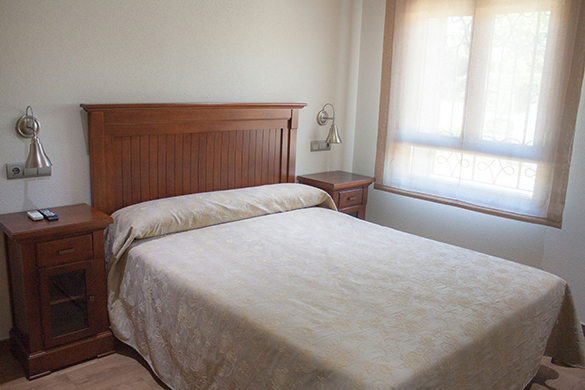 Breakfast at hotel, departure from Navarredonda de Gredos at 10 a.m., to be at Madrid Airport about 12.30 p.m. so, please flights not before 2 p.m. All riders will be transferred at the same time, if any rider needs to arrive Madrid before, we can arrange special transfer at extra cost. 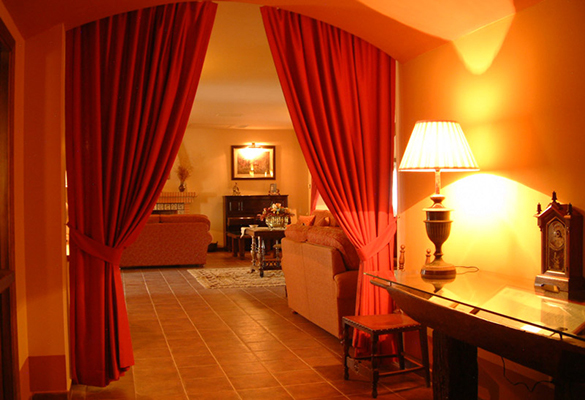 Same itinerary in opposite direction, starting in Navarredonda de Gredos and finishing in Trujillo. 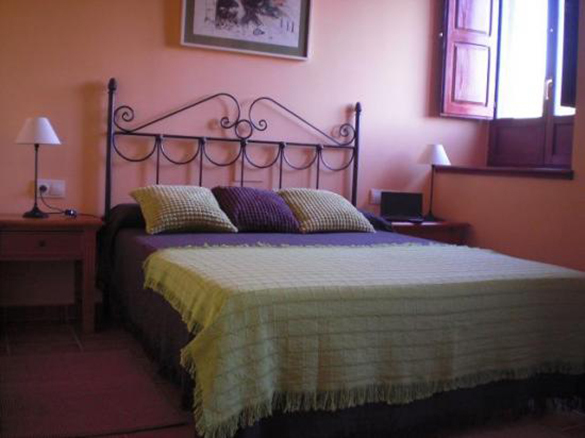 The accommodation along the way in the Transhumance ride, varies from charming rural Inn in villages to delightful 4* hotel in Trujillo town. 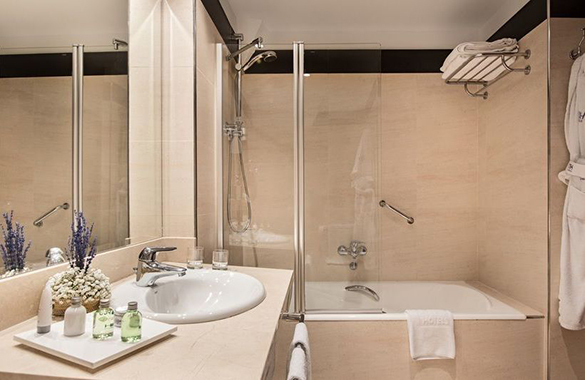 All rooms have private bathrooms. All of them very clean and comfortable. 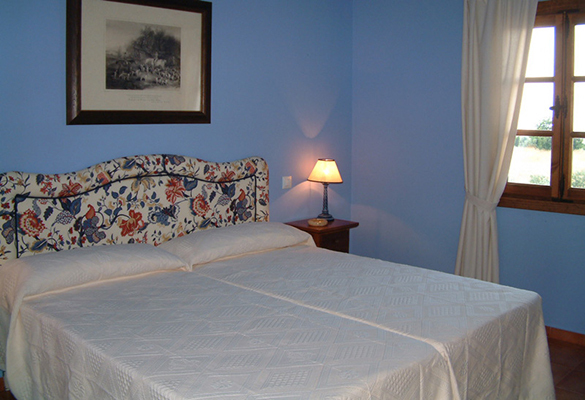 The price is per person and includes: all transfers from the meeting point, all meals from the welcome dinner on the first day to the breakfast on the last day, white and red wine with lunch and dinner, accommodation in twin bedded rooms with privet bathroom, riding, horses, tack, English speaking guide, luggage transport and excursions described in itinerary. All to an excellent standard. 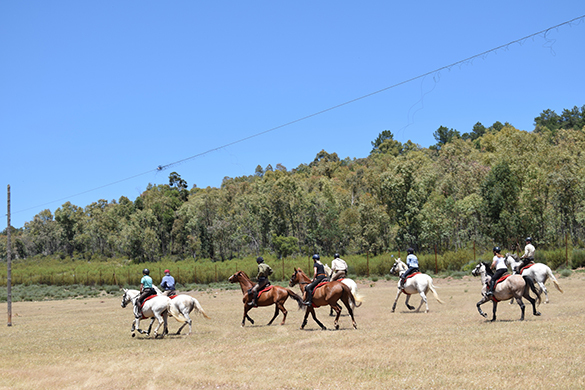 “Transhumance ride” The itinerary is 9 days, 8 nights, 7 days riding from Sunday to Saturday. 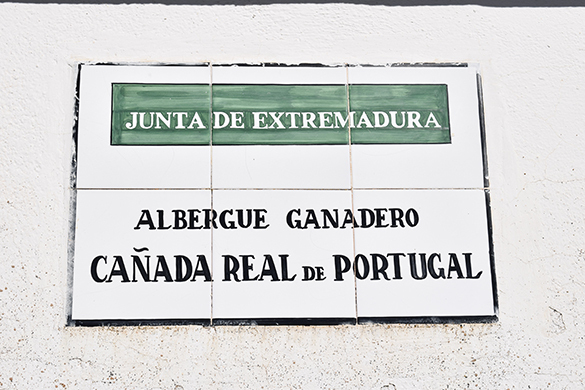 The length of the ride it is around 200 km. 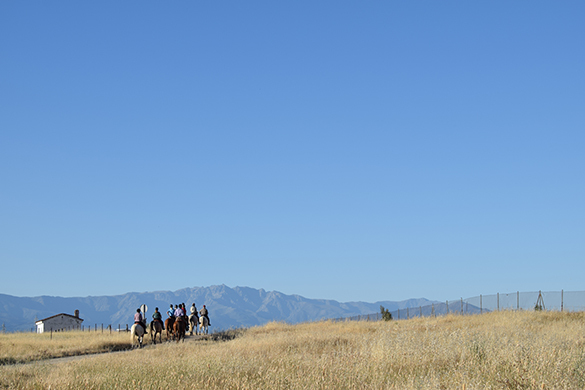 This is a unique ride, we offer only one date for the North Transhumance ride in spring and only one date for the South Transhumance ride, in autumn, following the tradition of our transhumant culture.